Product #46472 | SKU DAP3 | 0.0 (no ratings yet) Thanks for your rating! 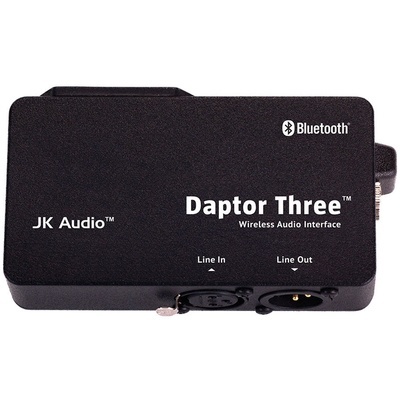 The JK Audio Daptor Three is an audio interface designed specifically for use with cell phones and cordless phones. It features XLR and 3.5mm mini I/O connections that can receive signal from line level devices such as recorders, mixers, and more. Bluetooth wireless technology enables the Daptor Three to interface without cables and hard-wired connections. And it is perfectly capable of connecting with virtually any Bluetooth compatible device, such as laptops. The Daptor Three features Bluetooth wireless technology for interfacing with cell phones, cordless phones, and computers, providing an easy and efficient solution for telephone interviews, live broadcasts, etc. The Daptor Three features I/Os for both XLR and 3.5mm mini configurations (one set for each type). The unit accepts signal line level devices. In Wireless Headphone mode, the Daptor Three offers a full audio bandwidth stereo connection.